Garage Storage Cabinets of Tucson. The best cabinet prices in town! Your Tucson Slide-Lok Dealer will be happy to assist you with installation of your Slide-Lok garage storage solution. 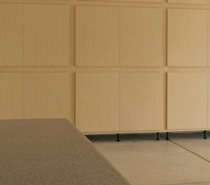 Click here to contact your Tucson Slide-Lok Garage Interiors & Storage Cabinets dealer. Looking to liven up your garage, closet, kitchen, basement, or man-cave? Look no further than Slide-Lok's customized garage storage cabinets, overhead storage, closet cabinets, flooring systems, slat-wall and accessories. We have something to meet everyones individualized needs for storage mixed with looks. Our classic series is refined for a warm looking garage with natural colors. Where our tech-series shines is in a gear heads garage filled with toys of all sorts from bikes, cars, hot rods, to off-road vehicles and more. Our tech-series features a flashy gray/silver and black design - more sleek and advanced looking compared to our classic series of cabinets. Slat-wall complements any cabinet configuration in matching color and is great for holding tools and much more! Get organized today! Don't let a cluttered garage, storage basement, or messy closet stop you. Call us today for professional help designing a custom storage solution for your storage needs. For the refined looks of a finished home, garage, basement, closet, or kitchen, let us help you get the best quality products in your home at the best possible prices. Our modular designed cabinets and patented dove-tail joint design makes our cabinets unique and easy to assemble and install. The modular design of our plywood storage cabinets make our cabinets easy to mix and match for any storage needs. If you want to build a little storage now, and add more storage cabinets later, that's no problem! Our cabinets will mix and match accordingly and are easy to mount together for seamless looks. If it's durability and quality you're after, then look no further! Our plywood cabinets outlast and out-perform our competitors cheaper and inferior particle board cabinets. Particle board is not the same as quality plywood. Particle board will chip, deteriorate, and not last as long as plywood cabinets. Not to mention, if you get particle board wet or in a moist or damp environment it will sag and fall apart on itself effortlessly. Whereas plywood is much stronger, made of sheets, and some of the most durable materials to use in cabinets and home furnishings. For questions, comments, or your Free Estimate, please call us today at 520-270-9861. We can get your storage project started started today! For our Sitemap/Link directory please click here. Slide-Lok of Tucson, and Garage Storage Cabinets Tucson, serves the following areas around Tucson, Arizona: Catalina Foothills, Casas Adobes, Westwood Look Estates, Flowing Well Neighborhood, Menlo Park Panorama Estates, Westside Development, South Tucson, Sunset Hills Estates, Drexel Heights, Midvale Park, Summit, Littletown, Drexel Alvernon, Terra Del Sol, Houghton, Tanque Verde, Bear Canyon Vista, Sabino Canyon Clusters, Ventana Canyon Lake Estates, Civano, Rita Ranch, Estates at Cienega Creek Preserve, Rancho Del Lago, Tortolita, Oro Valley, Desert Springs, University of Arizona, Rancho Vistoso, New Tucson, Armory Park, Sunny Acres, Midtown, Avondale, The Lariat Estates, and other Tucson towns. Contact us to see if we serve your area or want information on franchising and becoming a dealer.